Our customer service and engineering staff have more than 180 years of combined expertise in the wire rope industry. Daily we help our customers reduce costs, improve profitability and provide them the ability to offer more products to their customers. We not only provide basic standard custom wire rope fittings – we’ll collaborate with you to design and engineer solutions for your most challenging applications. Our fitting stock is immense. We inventory a wide range of standard and custom wire rope end terminations, and more than 25,000 part numbers. What we don’t have in stock we custom manufacture to meet your needs. 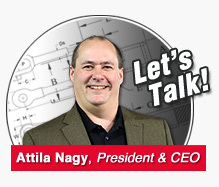 Let’s talk about your toughest manufacturing challenges. Our engineering staff works with you to design solutions for your most demanding applications. Our knowledgeable and responsive team builds high quality cable assemblies – on demand. Often same day turnaround. Have you seen our facility? Our 45,000 square foot state-of-the-art facility boasts a dozen computer controlled lathes and machining centers, 20 swaging machines, hundreds of various dies and proof testing capability. We manufacture fittings and tooling on site. Our swaging dies are kept up-to-date and always meet specs. We utilize the finest American made and imported materials available with mill certification and traceability on parts and fabricated assemblies.